Despite some weather setbacks, Cedar Rapids parks staff finished tilling and marking all three of the city garden sites this week. Cedar Rapids leases out 150 plots at Ellis Park; 102 at Squaw Creek Park and 60 at the Tuma Soccer Complex. As of today, only 97 plots were rented at the Ellis garden, which was flooded out for the season last June. Soil tests for benzene, arsenic and other chemicals have come back at safe levels, but some of the people who gardened at Ellis may have also been flooded out of their homes and won’t be back to garden. I spoke to E.B. Kunkle of Cedar Rapids today, who appeared to be the first gardener back at the Ellis site. E.B. was planting onion sets. Last year, he was able to harvest green onions, spinach and radishes before the floods wiped out everything. Gardeners were advised against returning last year due to possible contaminants. Today’s weather was in the 50s and the soil was dry enough to get started, at least on onions. E.B. has tried growing potatoes in the past, but they were overcome by (my nemesis) the potato beetle. Gardening lore calls for potatoes to be planted on Good Friday, which is tomorrow (April 10, 2009.) I doubt that I’ll get mine in that day, but as usual, turned to my uncle, Craig Musel, for advice. Uncle Craig gardens near Chelsea, Iowa, and always manages to win at least a few blue ribbons for his potatoes at the famous and fabulous Iowa State Fair. I talked to him Monday, and he said he started planting his potatoes about three weeks earlier, which would be mid-March. His tip? “I plant them whenever I can get them in the ground,” he said and keeps planting “until I’m done.” Those blue ribbon winners – never want to reveal their secrets. Randy Schultz passed along these photos on behalf of the Mailorder Gardening Association. The group, also known as MGA, is the only nonprofit organization for companies involved in marketing gardening products to consumers. The association presented their 2009 MGA Green Thumb Awards for six new plant varieties and five new gardening products. Bring­ing home awards in the Plants, Bulbs and Seeds division were Rudbeckia x hirta ‘Cherry Brandy’ from Thompson & Morgan, Begonia x tuberhybrida ‘Scentsation’ F1 Hybrid from Thompson & Morgan, Organic Prairie Blush Potato from Wood Prai­rie Farm, Bonbini Lily from Dutch Gardens, Angel’s Trumpet ‘Angel’s Dream’ PPAF from Logee’s and Honey Bear Winter Squash from Johnny’s Selected Seeds. Honored in the Tools, Supplies and Accessories division were Liquid Net® for Pets from The Liquid Fence Company, Golden Delicious Apple Collection for Children from Stark Bro’s, Plant Cottage from Gardener’s Supply, Optimum Deep Plug Starter Kit from Charley’s Greenhouse & Garden and Liquid Fence® Mole Repellent Worms from The Liquid Fence Company. Winners of the 2009 MGA Green Thumb Awards were chosen by an independent panel of garden writers and editors. The winning products were selected based on their uniqueness, technological innovation, ability to solve a gardening problem or provide a gardening opportunity and potential appeal to gardeners. Gardeners and farmers market vendors I’ve spoken to this spring show consensus that everything is at least two weeks behind our typical Iowa growing season. For the most part, I agree. While it’s nice to enjoy the scent of lilacs at the end of May, I’m still waiting to pull my first radish. But one thing, I discovered, seems even earlier than usual. This weekend I was encouraged to see that all my potatoes had finally emerged at the garden I lease from the city. While things are slow, most plants are looking great. Upon closer inspection, I saw something striped and moving and NNNOOOOO!!! Already, it’s time for Iowa’s pest season to begin. 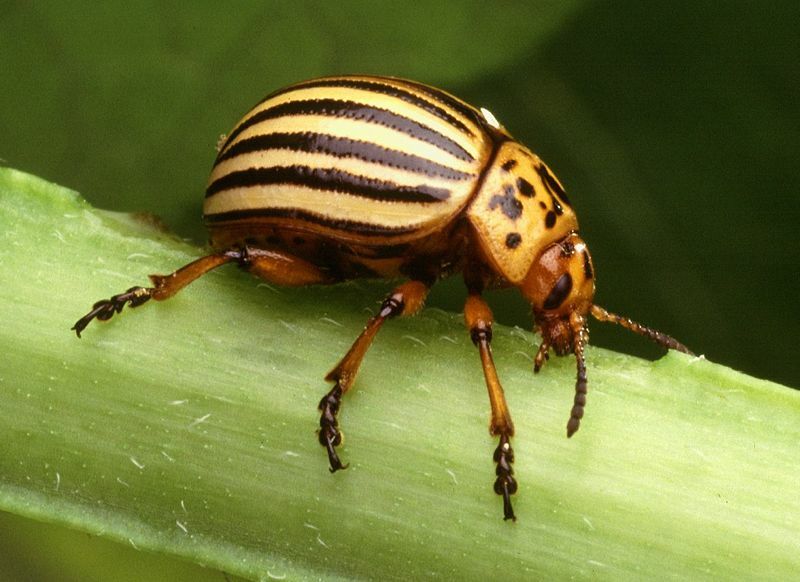 The dreaded Colorado potato beetle — Leptinotarsa decemlineata — the bane of my tiny potato crop, was already at work decimating the foliage just as the plants emerged from the ground. I looked to the helpful New York Times “1,000 Gardening Questions & Answers” book, a gift from my friend Dru (thanks DruJ) to research what I might do this year to battle these beetles. What I found was somewhat discouraging. The organic methods I prefer aren’t very effective when a single female can produce 10,000 offspring by the end of summer. I’ve used the powder Garden Guard on the potatoes, but it only stays on as long as it’s not windy or rainy. That’s what — about two hours on any given day this spring? Knowing the damage they wreak, I’m much less squeamish about squishing the little buggers than I would have been in the past. The Times’ book recommends organic gardeners apply a dose of Bt (Bacillus thuringiensis) to kill the small larvae. Larger larvae and adults can be killed with rotenone, a strong but short-lived botanical poison favored by organic gardeners when they must take extreme measures. To add insult to infestation, the book notes, Colorado potato beetles can live a full two years. But they won’t stay if there’s nothing to eat, so the final – or first – line of defense is late planting. If they don’t find any potato, eggplant or nicotiana leaves when they emerge from the ground in spring, they’ll leave. So, I’m too late (or I was too early) to try that last idea. I do try to rotate where I plant the potatoes, but it doesn’t seem to matter where they go. The beetles will find them. Maybe next year, I’ll go for the late start. Any other suggestions?